With Christmas drawing closer it can be fairly hectic around the shops. The Sligo Leitrim Garda Division have released the following security advice to keep in mind as you hit the shops this festive season. ▪️Be careful when withdrawing money from cash machines and financial institutions. Always cover you hand when you are entering your pin and be aware of anyone standing too close when you are using an ATM. If you don't feel comfortable, go to another machine. ▪️Mind your belongings when in crowed areas. Use a handbag or shoulder bag that can be held securely and ensure it is closed. Never leave your bag hanging unattended on a trolley. ▪️Don’t leave luggage or valuables exposed inside a parked car. Lock them out of sight in the boot if you can't head straight home with them. ▪️Don’t leave luggage attached to the roof rack. ▪️When visiting the Town centre area, park your car legally and don't cause an obstruction, the last thing you want is a parking ticket, or worse ; your car towed! ▪️Always lock your car securely when leaving it unattended, even for brief period. And make sure it is locked, some criminals have used Signal blockers so don't walk away and remotely lock your vehicle. Lock it and check that it is locked by lifting the door handles before you walk away. 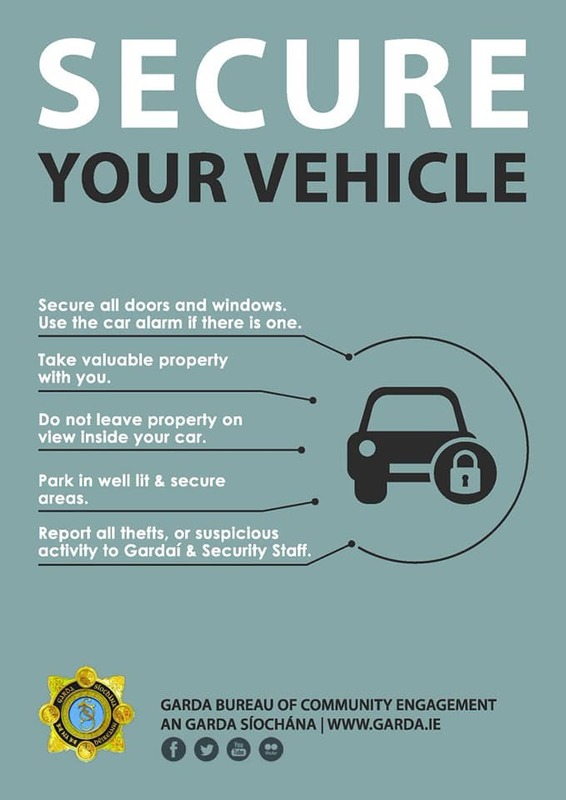 ▪️Report any thefts to Gardaí, immediately. The sooner the incident is reported the greater the chance of recovering any stolen property.